Traditionally, there is an emphasis on the use of design to teach technological skills in visual studies and technical communication. However, this narrow definition of design as technology-driven has been critiqued for its oversight of the need to cultivate students’ “conceptual, theoretical, and even practical knowledge” (Northcut & Brumberger, 2010, p. 463). Moving beyond the framing of design as merely a knack or skill, a growing body of scholarship has begun to acknowledge the significance of design in enacting social justice for both teaching and research. For instance, following the call for enhancing civic engagement and service learning in public writing contexts (Deans, 2000; Grabill, 2007), some scholarly efforts have been made to expand multimodal design as a form of critical practice and social action in composition classrooms (Sheridan, Ridolfo, & Michel, 2012; Warren-Riley & Hurley, 2017). Promoted by these scholars, multimodal campaigns and projects—those that foreground the design of digital texts, brochures, and websites in advocating for public good—are exemplary practices for building a nexus between multimodal design and social advocacy. More broadly, an interdisciplinary investigation into design prompts us to recognize the concept as a capacious term that can also be applicable to User Experience tools, DIY makerspaces, industrial designs, software applications, among other forms of design practices. In this webtext, DRC fellows Jialei Jiang and Jason Tham will outline the scholarly engagement with what we name to be “design advocacy,” or social justice initiatives actualized through design, in the interconnected fields of digital rhetoric, multimodal composition, and technical communication. 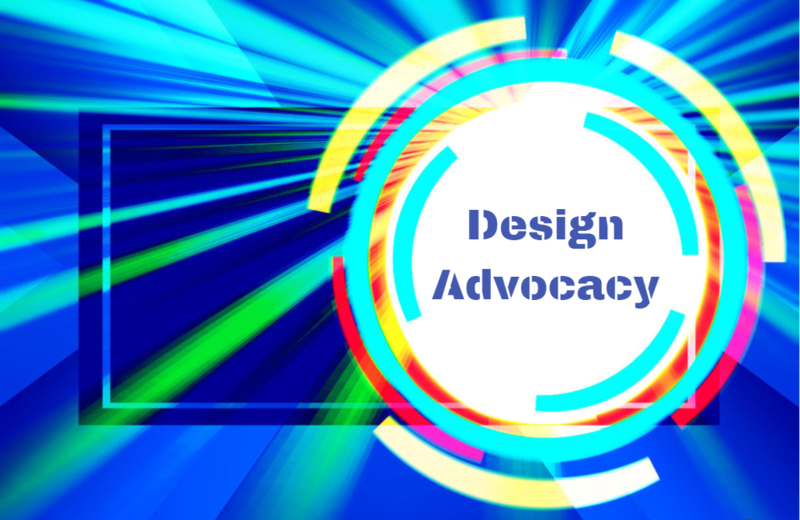 Alongside our survey of the current trends, we hope to chart new directions for future inquiry into design advocacy, and to invite public participation in an upcoming blog carnival on this topic. In digital rhetoric, design has been defined as “a rhetorical function that plays an important role in each of the canons of rhetoric, most obviously related to style (particularly in terms of visual rhetoric), but also of organization” (Eyman & Ball, 2014, p. 115). Thinking of design as related to style, however, is not commensurate with reducing design to the “superficial” task of decorating objects. Rather, research in design scholarship increasingly draws our attention to the role of design in “making a meaningful thing” (Marback, 2009, W402). One method for injecting new meanings to the rhetoric of design is through turning towards social justice and ethical theories. The intersection of design and social advocacy echoes the recent return to virtue ethics in rhetorical studies and digital scholarship (Arola, 2018; Duffy, Gallagher, & Holmes, 2018; Frisicaro-Pawlowski, 2018). Arola (2018), for instance, has drawn upon indigenous epistemologies, or marginalized groups’ ways of knowing, to propose a more ethical approach for visual design in digital spaces. Simply put, in rethinking the place of design in digital rhetoric, we must also consider design as a social action for sponsoring ethical rhetorical practices, and accordingly, as an avenue for fueling social justice work. With the goal of integrating design advocacy into digital rhetoric pedagogy, DRC fellow Jialei Jiang challenged her First-Year Composition students last fall (2018) to design multimodal campaigns in response to social equity issues. More specifically, to address social problems tied to the students’ communities of practices—e.g., local foods, environmental issues, and income inequality—Jialei’s students designed nonprofit multimodal campaigns that consisted of a website, a mission, a brochure, and an advertisement. By way of encouraging students to collaboratively engage in solving real-world problems, these design activities and assignments enabled first-year students to sustain their growth as socially-responsible writers and designers. Such design initiatives also opened the possibility for students to broaden their rhetorical understanding of design beyond reductive and functional terms, and to cultivate their critical awareness of social equity issues through guided processes of research and design. Design includes analog and digital solutions that utilize all available means of communication (and action) to address any existing needs or problems. In a multimodal composition classroom, students may learn to be advocates for those who are marginalized or silenced through design (Fleckenstein, 2010; Sheridan et al., 2012; Wysocki & Lynch, 2018). By allowing students to participate directly in the design process, students gain greater agency and access to community issues, such as food insecurity, housing injustice, etc. Last summer (2018), DRC Fellow Jason Tham collaborated with a local food shelf to inspire students to innovate radical solutions to address pressing social issues through multimodal composition. Jason’s students learned about the food shelf initiative, engage community volunteers and food shelf clients, and then worked in teams to devise implementable design solutions that help address specific issues facing the food shelf. Following the design thinking model, students empathized with stakeholders, defined respective user issues, ideated radical solutions, built and tested prototypes, and presented final design solutions to food shelf volunteers. With their developing knowledge of the affordances and limitations of various modalities, students worked to craft solutions with materials that serve the most benefits to multiple stakeholders. The final design solutions included visual and verbal (posters), digital and networked (computer applications), and procedural and spatial (physical setup, arrangement) modalities. Students considered how social change can be led by design, and how they can assume the key role of “design advocates” by practicing different modes and modalities. A multimodal composition classroom is a perfect sandbox for this kind of learning to take place, letting students apply design and composition theory in solving social issues. In technical communication, scholars and practitioners have become increasingly attentive to the key role that technical communicators play in shaping civic engagement and in advocating for social inclusivity. Due to the field’s historical connection with feminist, critical race, disability, and user advocacy research, technical communicators and researchers share the responsibility to make information more accessible and comprehensible to diverse groups of users (Agboka & Matveeva, 2018; Jones, Moore, & Walton, 2016). It is also worth mentioning that the growth in digital media innovations makes salient ethical issues online, including, among others, racism in closed captions, social media slacktivism and shaming, computer gaming ethics, GPS and behavioral tracking, and algorithmic regulations (Colton & Holmes, 2018). Through attending to these issues, technical communicators and designers can engage in a more ethical practice of proposing responsible solutions to design problems. In her recent publication about participatory design (Rea, Cannon, Sawchyn, & Walkup, 2018), DRC fellow Katie L. Walkup, together with her research collaborators, reported on a case study regarding the design of a bibliotherapy library at a local women’s residential drug rehabilitation center in Tampa, Florida. Informed by participatory design strategies, this study explores the potential of using journaling to work with vulnerable populations for service learning purposes. The findings suggest that technical communicators need to be responsible and reflexive when designing for vulnerable and disenfranchised social groups. In this sense, it is of paramount importance for technical communicators to become initiators of social change and advocates for ethical design. How might we further re-define or re-contextualize the rhetoric of design to include considerations of ethics, advocacy, and marginalization towards issues of social, material, and technological equity? How does design advocacy allow us to reframe and rethink the relevant theories and practices within the individual disciplines of digital rhetoric, multimodal composition, and technical communication? In what ways can we sustain design advocacy across the borders and boundaries of these fields of study? How will design advocacy disrupt disciplinary boundaries and/or carve out new spaces of inquiry? What challenges or difficulties may distract us from leveraging the full potential of multimodal design in fostering social advocacy? What are ways to address and overcome these challenges? With these questions in mind, DRC fellows invite scholars to join our conversation of “design advocacy.” We welcome public contributions to an upcoming blog carnival on multimodal design and social advocacy, and will follow up with a Call for Submissions that provides more details on how to participate in the blog carnival. Agboka, G., & Matveeva, N. (Eds.). (2018). Citizenship and advocacy in technical communication: Scholarly and pedagogical perspectives. New York: Routledge. Arola, K. L. (2018). A land-based digital design rhetoric. In Alexander, J. & Rhodes, J. (Eds.). The Routledge handbook of digital writing and rhetoric (pp. 199-213). London: Routledge. Colton, J. S. & Holmes, S. (2018). Rhetoric, technology, and the virtues. Logan: Utah State University Press. Deans, T. (2000). Writing partnerships: Service-learning in composition. Urbana: National Council of Teachers of English. Duffy, J., Gallagher, J., & Holmes, S. (2018). Virtue ethics. Rhetoric Review, 37(4), 321-392. Eyman, D., & Ball, C. E. (2014). Composing for digital publication: Rhetoric, design, code. Composition Studies, 42(1), 114-117. Fleckenstein, K. S. (2010). Vision, rhetoric, and social action in the composition classroom. Carbondale: Southern Illinois University Press. Frisicaro-Pawlowski, E. (2018). Rhetorical ethics and the language of virtue: Problems of agency and action. College English, 81(2), 110-132. Grabill, J. T. (2007). Writing community change: Designing technologies for citizen action. Cresskill: Hampton Press. Jones, N. N., Moore, K. R., & Walton, R. (2016). Disrupting the past to disrupt the future: An antenarrative of technical communication. Technical Communication Quarterly, 25(4), 211-229. Marback, R. (2009). Embracing wicked problems: The turn to design in composition studies. College Composition and Communication, 61(2), W397-W419. Northcut, K. M., & Brumberger, E. R. (2010). Resisting the lure of technology-driven design: Pedagogical approaches to visual communication. Journal of Technical Writing and Communication, 40(4), 459-471. Rea, J. M., Cannon, P., Sawchyn, A., & Walkup, K. L. (2018). Journaling and bibliotherapy participatory design as a heuristic for program development. In Agboka, G., & Matveeva, N. (Eds.). Citizenship and advocacy in technical communication: Scholarly and pedagogical perspectives (pp. 153-174). New York: Routledge. Sheridan, D. M., Ridolfo, J., & Michel, A. J. (2012). The available means of persuasion: Mapping a theory and pedagogy of multimodal public rhetoric. Anderson, SC: Parlor Press. Wysocki, A. F., & Lynch, D. A. (2018). Compose, design, advocate: A rhetoric for multimodal communication (3rd ed.). Boston: Pearson. Greetings! I’m a design scholar who works in design and the digital humanities and I am interested in your work. I have to admit to being troubled by the fact that you do not refer to any literature from design studies and design theory in your conception of design. I ask sincerely, for my own research into how design is re-conceived when appropriated by other disciplines, are you aware that design is an academic discipline with histories, theories, and practices? And if so, what do you find lacking for the purposes of your own work? I see within your conceptions of design points of confusion that this well-developed field might help with. For example, your conception of design advocacy could benefit from the critiques of designer agency and positionality from participatory design and design anthropology. Your use of “design thinking” precepts from IDEO and the d.school are built upon philosophical precepts that run counter to an emancipatory social justice agenda informed by cultural and critical theory. In the spirit of dialogue, I would love to hear your thoughts! Anne, thanks for your comments! We agree that design studies inform a lot of the work we do in social advocacy. We do draw from design theories like Buchanan, Kaufer & Butler, Ritter & Weber, etc. to frame the ongoing discussion of multimodal design. Given the limited space here, we acknowledge the complexity of such work. We will certainly include them in the editors “outro” to the upcoming blog carnival on this topic. We are interested in continuing this conversation (especially on design thinking!) either here or future webtexts.